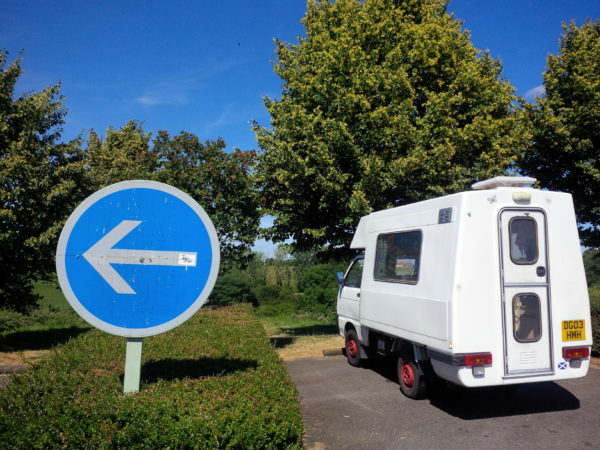 In this photo diary author Sue Reid Sexton takes us behind-the-scenes on a fascinating trip to the Midi-Pyrenees in the south of France as she combines a family holiday with using her trusty campervan, Vanessa Hotplate, as a mobile office and creative space. 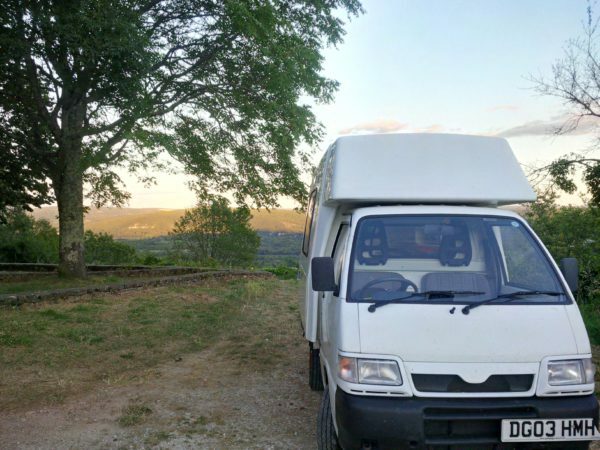 Meet Vanessa Hotplate, a small but perfectly formed Romahome campervan. Vanessa has living quarters for two, but for me the van functions best as a mobile office and creative space. 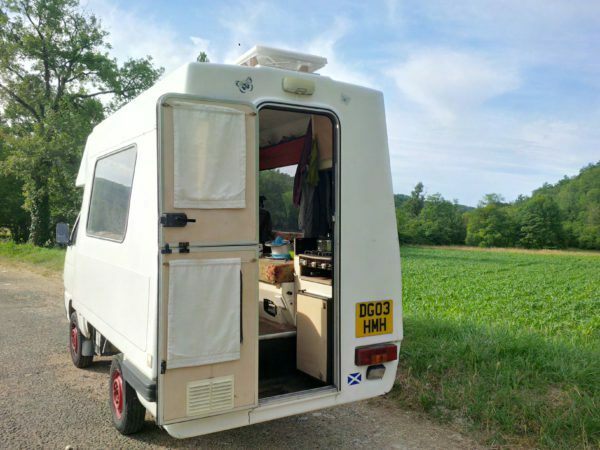 I favour laybys in isolated locations for this purpose and this summer, I voyaged all the way from Glasgow to a tiny village in the Midi-Pyrenees in the south of France. This was a distance of 1277 miles or 2043.2 kilometres to be exact and frankly more impressive. Such a journey is all the more remarkable with an engine of only 1,300 horsepower (though that does seem like a lot of horses) and dinky body a mere 3.95 metres long. The purpose of the journey was to prove I could do it. And to visit family too, of course. Ahem. And also to give myself some uninterrupted time to get on with the latest writing project. My habit is to find a layby, preferably one with limited phone connection, so I can climb in the back, open the laptop and have no alternative but to write. It’s amazing how difficult it sometimes is to get down to writing, even though it is thoroughly enjoyable once I do. It took several weeks to summon the courage to make this epic solo flight into the sun but I used the time to have the van serviced and checked so it would be in tip-top shape when the moment arrived. I arrived in France late in the evening and drove through the dark until I could drive no more. Luckily a ‘rest area’ appeared and I snuck between a larger campervan and a lorry and slept like a log. The next day, with only the nice American lady on the sat-nav for company, I drove until dusk. The navigator was set to non- péage so it threw me off the motorway just as a red sunset reached across the whole sky. At first I was frustrated by the twists and turns of the smaller road, then I found the perfect spot for the night, which is where you see Vanessa in the picture. Birds and insects serenaded me as I dug out the sleeping bag and settled down for the night. This would have been the perfect writing layby. It had a section which was completely flat, trees between me and the road upon which there was limited traffic, birdsong a-plenty, a field of maize and a hill covered in more trees on which to rest my eyes. Within the van I had supplies of tea, breakfast materials and other nibbles, a fully charged laptop, a battery to replenish it when necessary, a table to sit it on and a project which was difficult but enticing for its author. But my task at that point was to GET THERE, so after a quick glance at my project I hit the road, opted for the péage and was instantly stuck in a traffic jam. Drat! Wandering back roads is so much more fun. And also more productive. Over the course of this trip and in various ad hoc locations I re-drafted the first six chapters of a novel and added another. Almost none of this was done with friends or family anywhere near. Many of these writing sessions were brief but others lengthy. All brought a sense of submersion and focus, which makes it sound like swimming under water with a pair of goggles and seeing the wonders of that environment. That is exactly what it is, a diving deep into the inner world of the imagination and seeing what’s going on in there, then bringing the treasure up to the surface, otherwise known as the page. These writing sessions were possibly further enhanced by the fact that I was entirely with my own thoughts when I was driving the great distance to my destination. As you see from this picture, Vanessa has a snub nose which means the engine is under the seats, which in turn means it’s very noisy in there at 70mph. The audiobooks I had brought along for entertainment were inaudible. The only thoughts I could hear were my own. The only music worth bothering with was stuff I knew well enough to sing along to karaoke style, like Dvorak’s Cello Concerto and Martyn Bennett’s Grit. This provided exercise for the lungs which, having no companion other than the sat-nav, was quite important. But mostly I travelled in silence with my own thoughts. I was therefore more than ready, when chances arose, to get on with the writing. Next was in the ferry. France was playing Iceland in the European Cup on screens dotted about the ship. 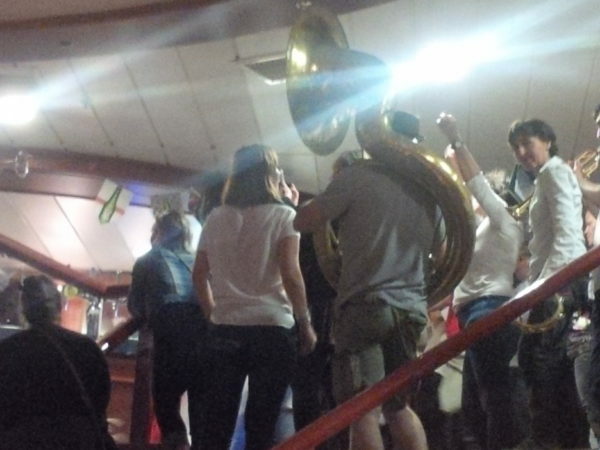 Among the French supporters was a brass band whose trumpeter played triumphantly when their team scored and the ‘death march’ when it was Iceland’s turn. Cosily ensconced at a side table near this spectacle, I somehow managed to write. This is a measure of the depth of immersion the project had already garnered. This is my daughter playing to a valley full of vineyards while her cousin edited a story for my sister, who lives in France and is a storyteller, and I sat alongside and wrote. It was a blazingly hot day and we were under trees with big fleshy leaves and tiny delicious raspberry-like fruit whose name I don’t know. It was one of those rare occasions I managed to write in company. The rest of the first week was with family, so there was no writing done at all. My attention was required at swimming pools, mountain lakes, picnics, family dinners, late-night discussions and walks. It was a lovely holiday, but the story I was writing was clamouring to get out. This is an uncomfortable sensation, as any writer or artist will tell you. 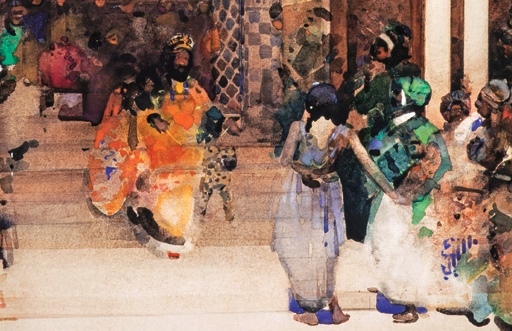 There were conversations and dramatic goings-on all playing out in my head which occasionally obscured the real life dramas and discussions going on around me. I can only imagine how annoying this must have been for other people, but I did manage to take occasional notes for the novel. There was an awful sensation of being split between several worlds. It was something akin to the ‘dissociation’ that often accompanies trauma. Obviously there was no actual trauma here, only the disconcerting feeling of having travelled a great distance to see loved ones then being unable to be wholly ‘present’. These two words, dissociation and present, are stolen from my life as a counsellor. Perhaps it is the habit of following an inner monologue, albeit someone else’s, that enables me to foster, cosset and feed my own inner muse in this way and to the extent which seems necessary to write a full-length novel. Obviously there’s a price. It’s like multi-tasking but with bells on. Not everything I did was to the best of my ability. Imagine my delight then when two friends gave me an open invitation to park my van in front of their house whenever I wanted and for as long as I liked. At last I was equipped with metaphorical goggles and diving equipment. I stayed below the surface until the end of my six chapters, surfacing occasionally for dinner and/or midnight discussions, then back down until I reached the end. Then, at last, it was time to retrace those 2000+ kilometres, but it wasn’t the end of writing. My first overnight stop heading north was in a picnic area south of Brive. It was typical of the kind found all over France. There were several picnic tables and benches, trees to provide shade from the baking sun, plenty of parking spots and an area which was flat and suitable for overnight campervans, and it was on the side of a hill with a fabulous view. Many of these rest areas also have special waste-dumping facilities for campervans, and toilets, though French toilets, I’m sorry to say, are always worth avoiding. I spent the next morning at the laptop, then drove a while and stopped again in a much larger rest area. This rest area had a perfect example of hideous French toilets as its centrepiece but was otherwise very well organised. Each car or campervan had its own little space surrounded by hedges and with trees for shade. They also had concrete picnic tables and views across green fields and farms, and no shops screaming at you to spend money like UK service stations. It was the perfect antidote to the motorway and ideal as a writing venue, good enough for me to spend the entire afternoon writing and to leave with a clear plan for the next section. 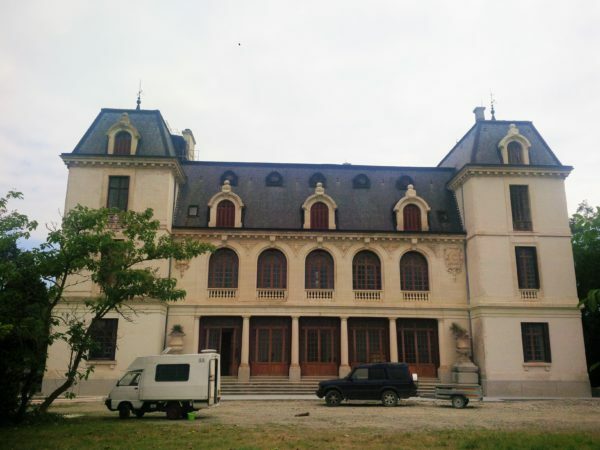 The rest of the journey through France was so stunningly beautiful I continued driving long after it was sensible and didn’t do what I had planned, which was to wander and pause to write for the next day and a half until it was time for my ferry. Instead I continued through yellow cornfields (with their distinctive smell) under a fading blue sky, then a sunset and into darkness until I was almost at Chartres. In a tiny village called Bonville I turned up a side street and parked, exhausted, crawled into the back, put a tee-shirt over my eyes (because I’d accidentally parked directly under a streetlight and was too tired to move again) and slept until morning. It wasn’t a suitable writing spot. The shutters beside my window squeaked open early the next day revealing crisp Guipure lace curtains, and exposing my tatty van to their owner. I quickly packed up and left without even having tea (shock … horror) and determined to stop and gather myself at the earliest opportunity. But the muse had stayed in bed. In fact the muse said she was exhausted and would see me back in Scotland where she knew there were laybys whose locations she knew and liked, preferred even. 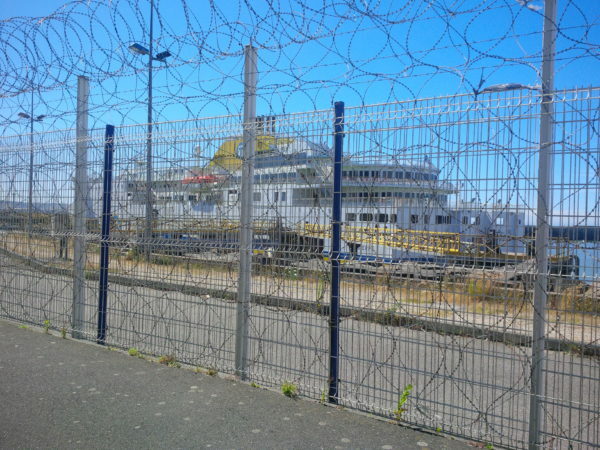 This inner discussion happened as I hung out in a parking bay near the ferry, seen here. I felt sure I could coax her back to play at a table on-board the ferry with a sea view. Sadly the boat was full of people with loud voices and all the best views were taken. I tinkered a little in the restaurant then joined the muse in a comfy seat for a doze. The moment had passed. I stopped several times on the way north through the UK but most of the service stations were about as relaxing as a teenage heavy metal concert outside your window with no police in attendance. Vanessa had at least played her part throughout the excursion. On the outward journey I was 10km short of my destination when the windscreen wipers stopped working. On the way home, and at roughly the same distance from the finishing line, my skylight came undone. A man in a passing car kindly indicated there was a problem and that the skylight was flapping up and down. You can imagine the hand signals. It was a bit like ‘you’re crazy’ followed by ‘you have a hairstyle like Donald Trump’. It was great to have travelled and to have overcome my fear about journeying alone, but it was even better to be home. And there’s still plenty of summer left to hit the highways and laybys of Scotland. 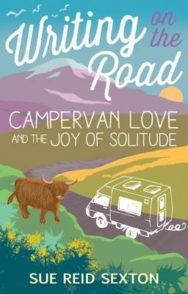 Sue Reid Sexton is author of Writing on the Road: Campervan Love and the Joy of Solitude, published by Waverley Books (£8.99, PB) and available now. 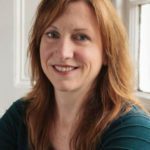 She is also author of Mavis’s Shoe and Rue End Street; Mavis’s Shoe will be published in Dutch in October.